I was 11 years old when President John F. Kennedy was gunned down in Dallas Texas. When the December 14, 1963 issue of POST was discarded by my parents, I stashed it in my personal archive alongside several Popular Electronics, Superman comics, an autographed picture of Allen Shepherd, and my almost complete set of the Classics Illustrated, where it languished for years. I never really looked at the photos in that POST. There was no need to. We all knew what had happened in Dallas, or at least we thought we did, having been so informed by the media and our government. Years later, when Jim Garrison introduced the possibility of a conspiracy to the American people, I finally took a close look at that magazine. What I saw shamed me to my very core. All along I had had before me actual evidence that Lee Harvey Oswald had not been on the sixth floor of the Dallas Schoolbook Depository when Kennedy was shot, but because of my faith in the Federal Government, I had never seen it. The lesson I learned that day has stayed with me ever since. The following photographs are scanned from the December 14th, 1963 issue of POST magazine. Click for full size (135K) picture. This photograph appears on page 22. 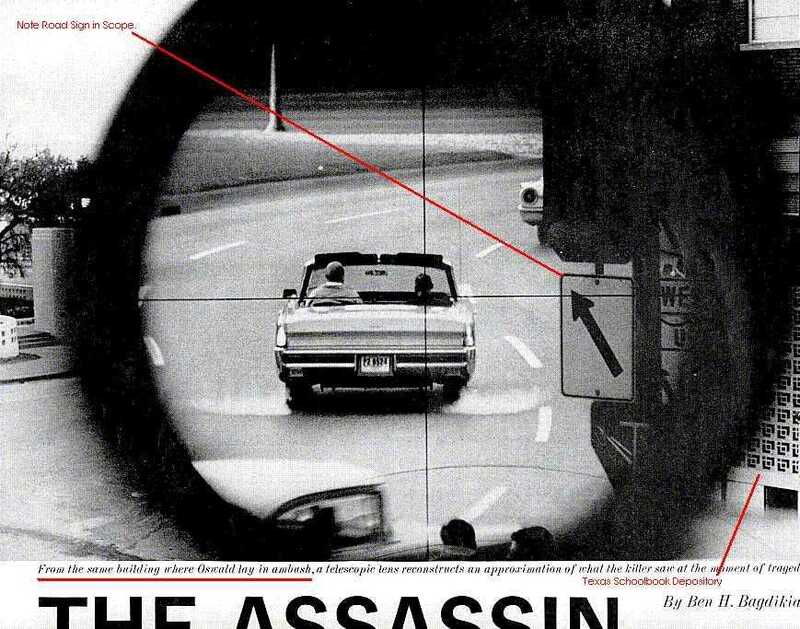 The caption reads,"From the same building where Oswald lay in ambush, a telescopic lens reconstructs an approximation of what the killer saw at the moment of tragedy". The photograph does appear to support the idea that a single shot could have hit both Kennedy and Texas Governor John Connally. 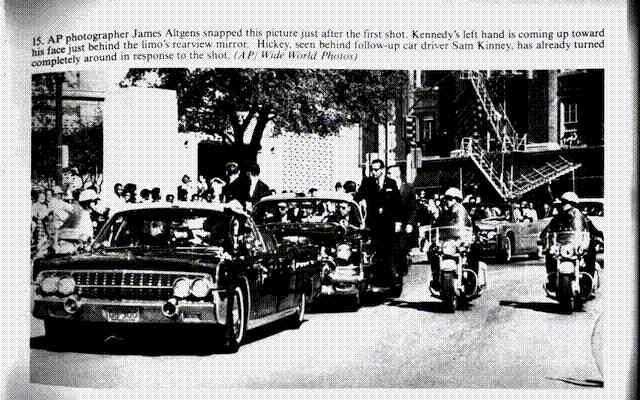 However, the photograph, despite the caption, was not taken from the schoolbook depository. The distinctive brickwork of the schoolbook depository (see photo from pages 24-25 below) is clearly seen on the right hand side of the photograph, proving that the photograph was actually staged from the Daltex building. The traffic signs clearly in view indicate a much lower angle than would be seen from 6 floors up. Compare the above view of the street with that seen in the next photo taken from just INSIDE the 6th floor window of the Texas Schoolbook Depository from which Oswald was supposed to have fired. Click for full size (374K) picture. This photograph appears on pages 24 and 25. Taken by AP Photographer James Altgens, it clearly captures the moment when John Kennedy clutches his throat. Note the following. John Connally is clearly turned to his right. Had he indeed been hit by the same bullet which has just exited Kennedy's throat, his wounds would have traversed his body from right to left. Connally's wounds were from back to front. 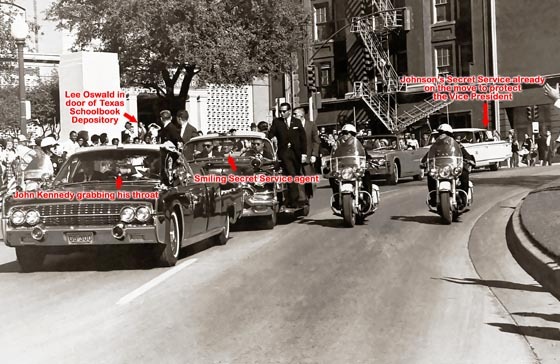 NOTE: The claim has been made that Connally was facing forward when JFK was shot in the neck, before the photo was taken, but in order to then see the view in this photo, Connally would have had to twist to his right after being shot! Note the turned heads of some of the policemen and Secret Service agents. Clearly, they have heard and are responding to the sound of gunshots. 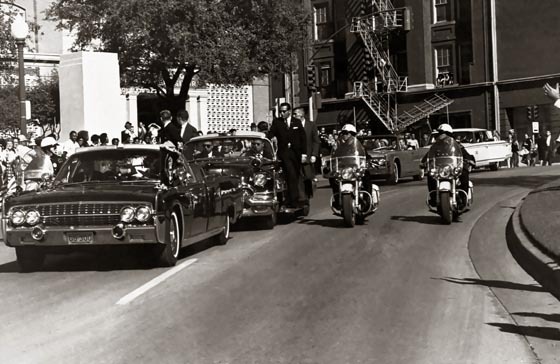 Note the fourth car back, which contains Vice President Johnson's Secret Service detail. The car doors are open as the agents rush to protect Johnson from the threat. Compare this with Kennedy's Secret Service detail, who have not moved at all. 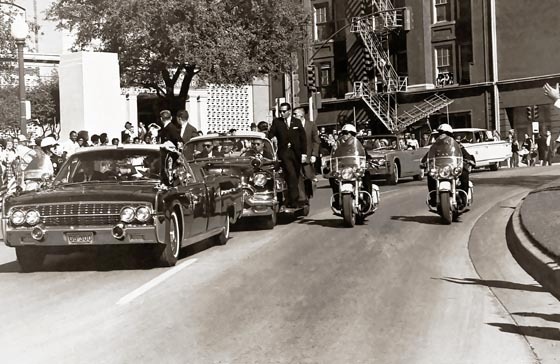 Also note the man within Kennedy's Secret Service car who is grinning ear to ear (tentatively identified as Dave Powers). It is interesting to note that in the book "Mortal Error" this photograph is deliberately cropped to hide the open doors of the car carrying V.P. 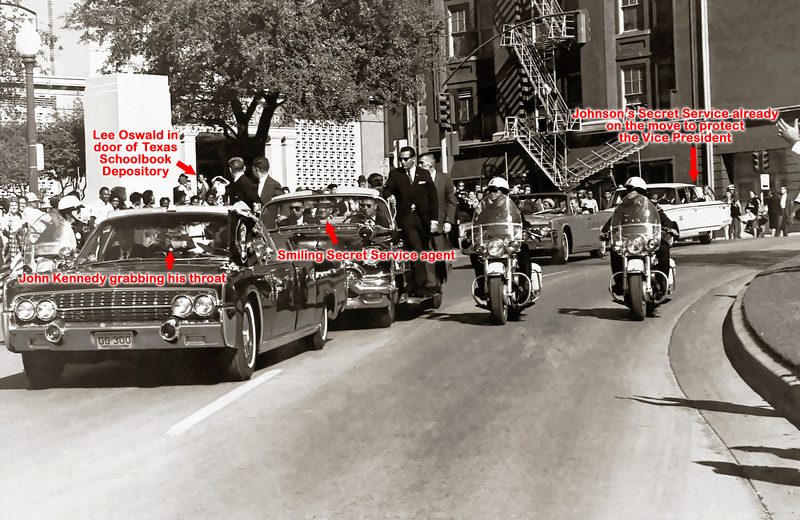 Johnson's Secret Service detail. Most importantly, note the man standing in the ground level doorway of the Texas Schoolbook Depository (which is where he reportedly told the Dallas PD he was at the time). Click for full size (44K) picture. This is the Altgens photo as it appears in the book "Mortal Error". Note that the photo has been cropped to hide the fact that Vice President Johnson's Secret Service detail has already opened their car doors while Kennedy's Secret Service detail remains motionless. Compare these two images. 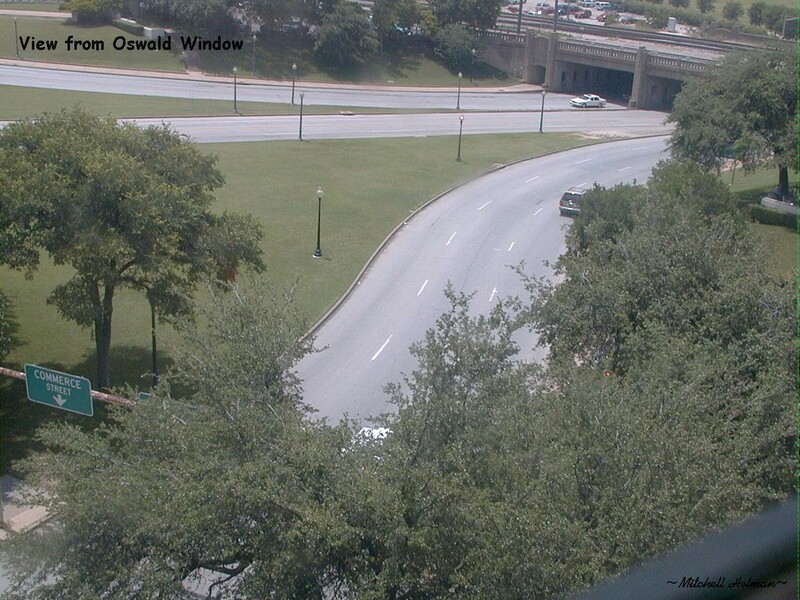 The man in the doorway of the school book depository, and Oswald's photo immediately after his arrest. 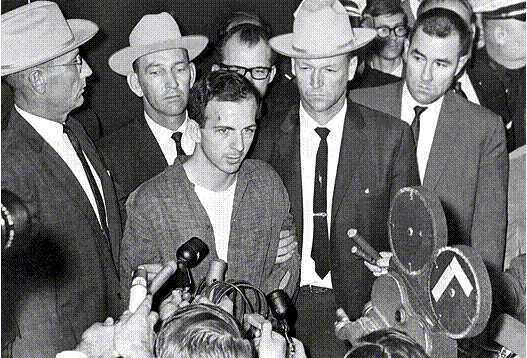 This is a photograph of Lee Harvey Oswald taken shortly after his arrest. 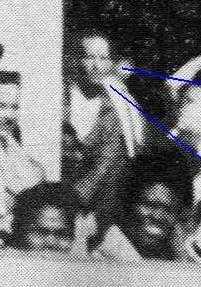 Note the clear similarity in both appearance and dress to the man in the schoolbook depository doorway in the Altgen's photo. 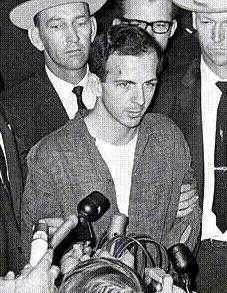 The Warren Commission "identified" the individual as Billy Lovelady, a fellow Book Depository employee. 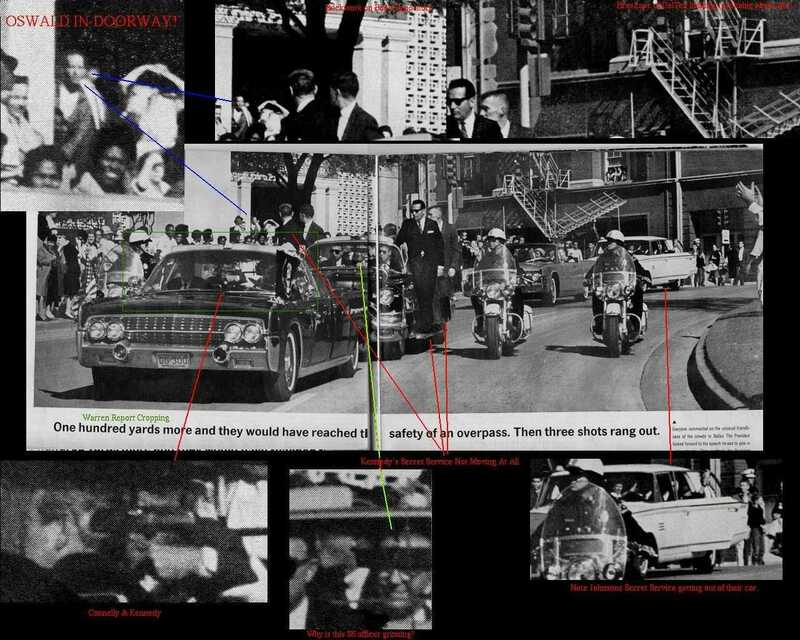 But while Lovelady claimed the person in the Altgens' photo was himself, he also stated that he'd worn a red and white vertically striped shirt on the day of the assassination, which was confirmed by photos of Lovelady taken at the time of the assassination! The man in the doorway's shirt in not striped and is open in front, exposing the tee shirt underneath. In color films taken from another angle, the color of the shirt worn by the man in the doorway was revealed to be orange-brown. 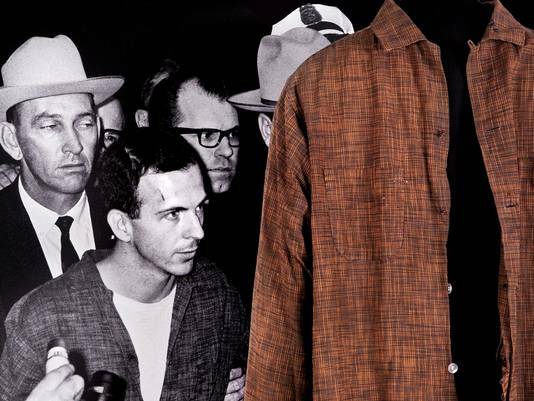 When Oswald was arrested, he was wearing the identical shirt- an orange-brown tweed with missing buttons and tee-shirt underneath. 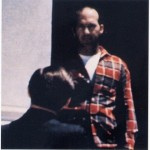 Other films taken on November 22, 1963 confirmed that Lovelady was in fact wearing a red and blue plaid shirt. Hence, the figure in the doorway is NOT Lovelady. NEW! Higher resolution versions of the Altgens photo!